Move to the slide that you want the new slide to follow. Click the Home tab and then click the New Slide button in the Slides group. This action reveals a list of slide layouts. Click one of the slide layouts that includes a Content placeholder. A slide with a content placeholder. SmartArt: Inserts a SmartArt graphic. Online Picture: Inserts a picture from an online source. Click the Chart icon in the middle of the Content placeholder. The Chart icon is the one in the middle of the top row of icons. Clicking this icon summons the Insert Chart dialog box shown here. Select the type of chart you want to create. Column: Data is shown as vertical columns. The columns can be displayed side by side or stacked, and you can pick various shapes for the columns, including simple bars, 3-D blocks, cylinders, cones, and pyramids. Line: The data is shown as individual points linked by various types of lines. Pie: The data is shown as slices in a circular pie. Bar: The same as a column chart, except the columns are laid out horizontally instead of vertically. Area: Similar to a line chart, but the areas beneath the lines are shaded. X Y (Scatter): Plots individual points using two values to represent the X, Y coordinates. Surface: Similar to a line chart but represents the data as a three-dimensional surface. Radar: Plots data relative to a central point rather than to X, Y axes. 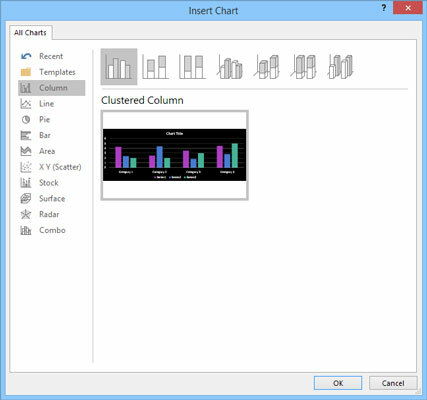 Combo: Lets you combine different chart types in a single chart. 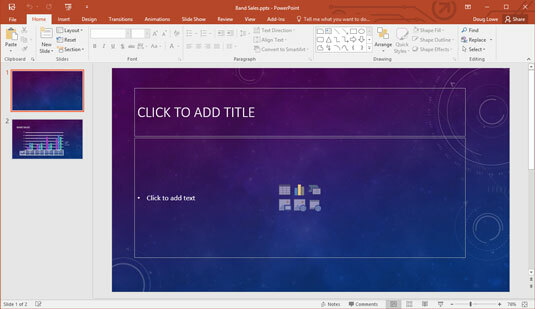 PowerPoint whirs and grinds for a moment and then inserts the chart into the slide, as shown. The reason for all the commotion is that to insert the chart, PowerPoint must find out whether Excel is already running. 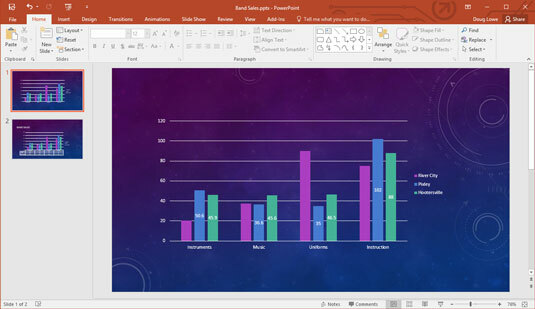 If not, PowerPoint launches Excel, as you can see in the figure. A chart after it has been inserted into PowerPoint. 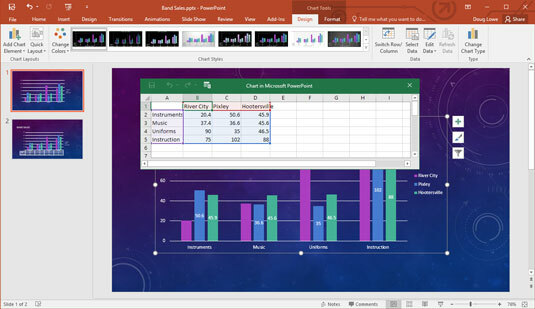 As you can see, the data for the chart is shown in a separate spreadsheet window that resembles Excel, tiled alongside PowerPoint. You need to edit the data in this spreadsheet to provide the data you want to chart. Notice that any changes you make to the spreadsheet data are automatically reflected in the chart. Customize the chart any way you want. For example, you can change the chart layout or style. This figure shows a finished chart. A slide with a finished chart.